ASP.NET Web API is an ideal platform for building RESTful applications on the .NET Framework, However for some reason there are no samples or documentation (as of this writing) of using the new Web API framework with ASP.NET WebForms. So I thought I’d write a brief post on how to do this. In order to get started, you’ll need to install, at minimum the AspNetWebApi package from the NuGet Gallery. Instructions for installing the package using the Package Manager Console are provided in that page as well. If I were you, I’d install two other package that you’ll need eventually. 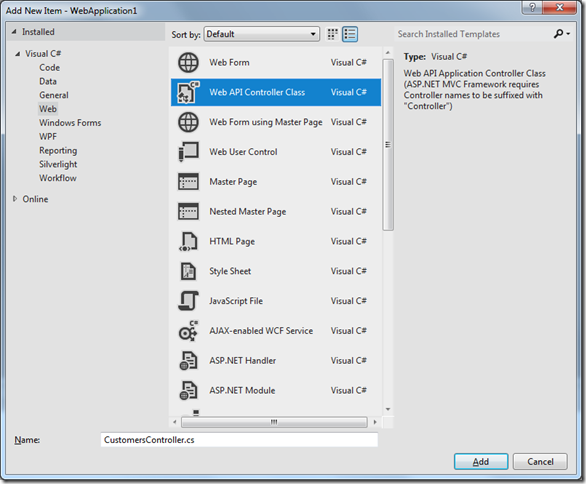 The Core package should get installed automatically when you install the AspNetWebApi package. 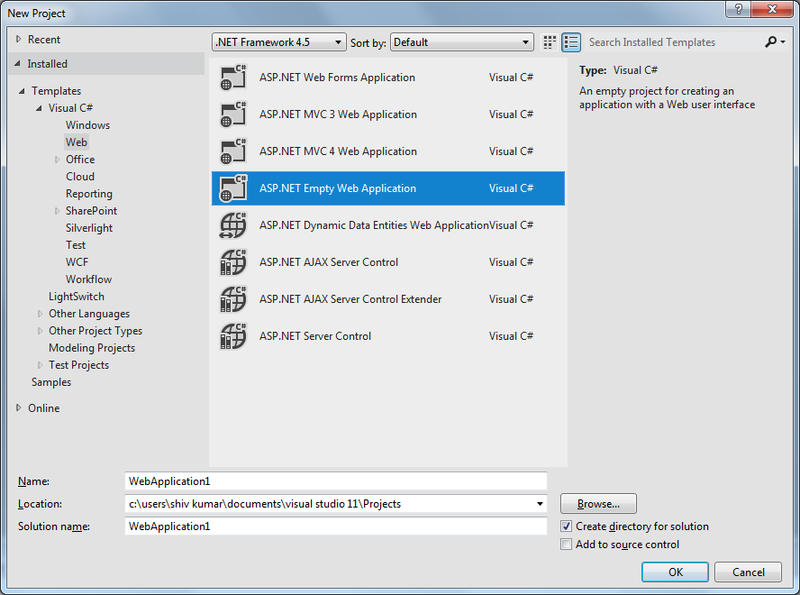 AspNetWebApi.Core -This package contains the core runtime assemblies for ASP.NET Web API. This package is used by hosts of the ASP.NET Web API runtime. AspNetWebApi.SelfHost - This package contains everything you need to host ASP.NET Web API within your own process (outside of IIS). ASP.NET Web API is a framework that makes it easy to build HTTP services that reach a broad range of clients, including browsers and mobile devices. You can do this using VS.NET 2010 or VS.NET 11 Beta (at this time). The process is identical after you’ve installed the perquisites mentioned above. 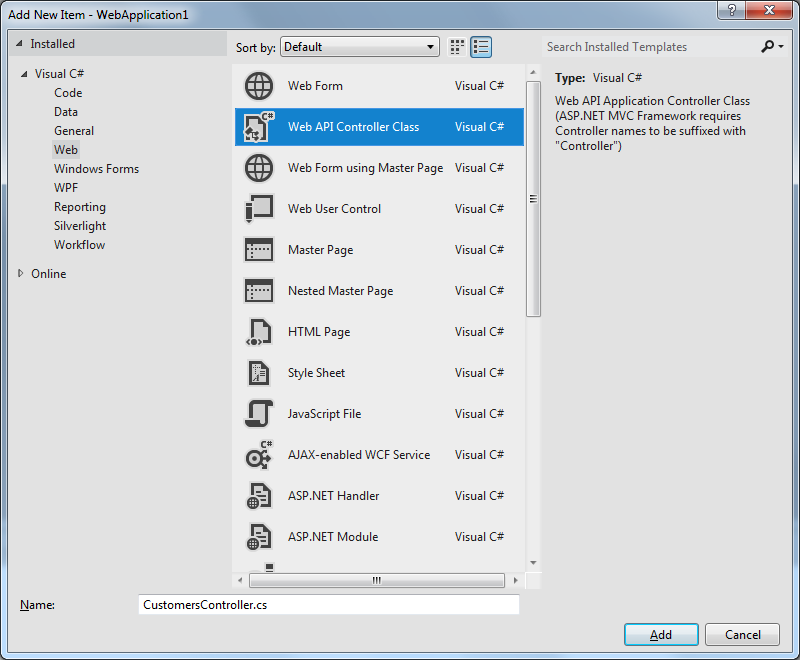 Next, add a Web API Controller to your project. And name the class CustomersController.cs. The name of the class is important here, because of the way we’ll set up our routing, and the conventions involved. If you’re building a Web Site project instead of a Web Application project, you’ll need to add the app_code folder to your project and then add the Web API Controller in this folder. Notice that the controller descends from ApiController. 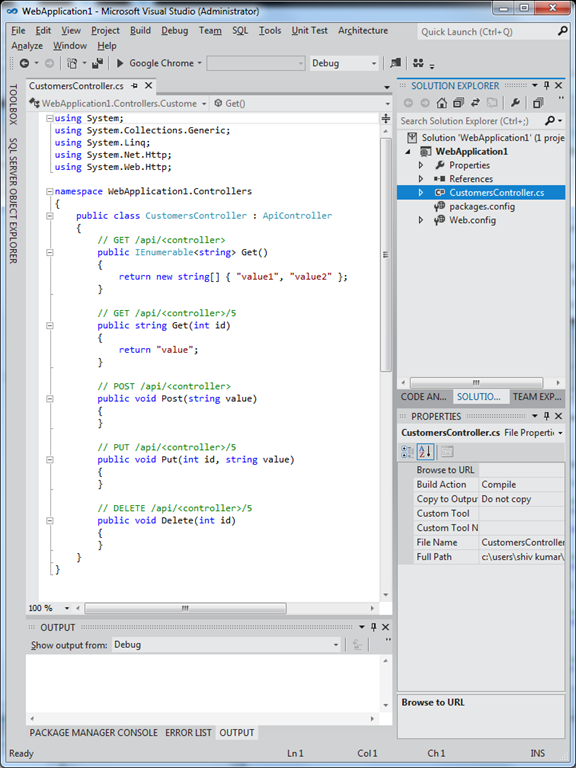 This is the base class for all WebAPI controllers because the built-in HttpControllerRouteHandler expects this. If you’re familiar with RouteHandlers, you can very easily plug into the pipeline and change all of this. In this post, we’ll keep it really simple and change nothing. 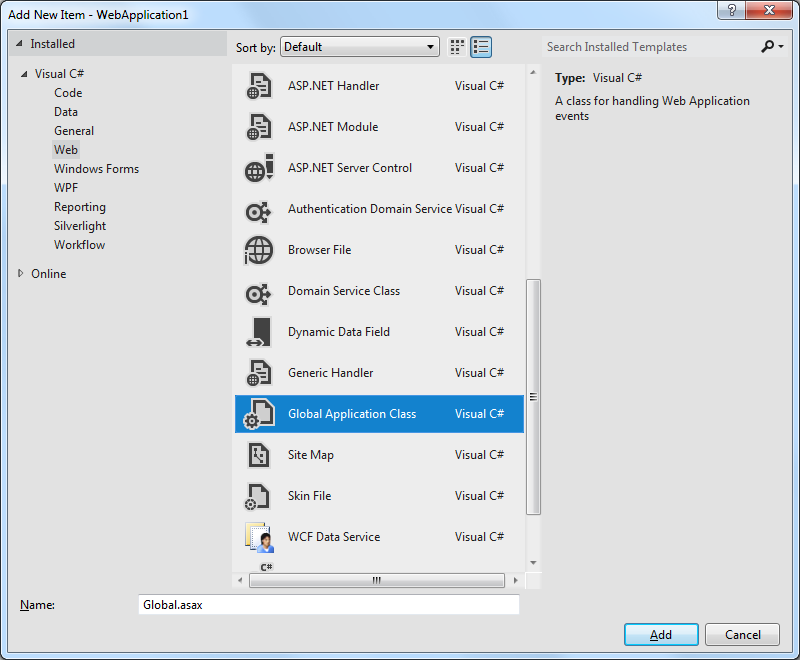 You’ll need to add Global Application Class, to your project. So add a new item to your project and select Global Application Class as shown below. Don’t rename it! Open the Global.asax.cs file by first expanding the Global.asax node in Solution Explorer and then double clicking on the Global.asa.cs node. That’s it! 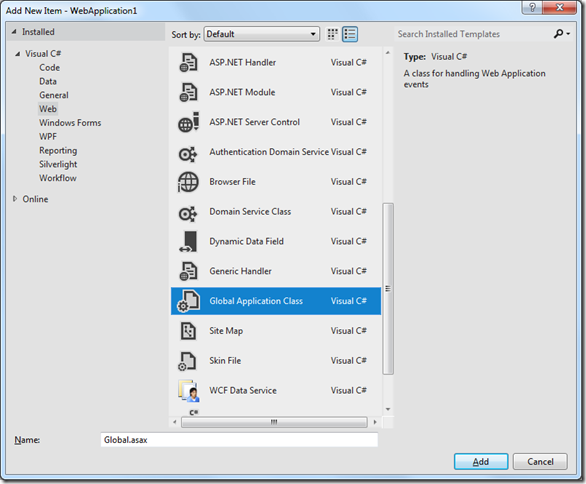 You’ve built your first Web API application with ASP.NET WebForms. That is, simply add the above to the url you see in your browser. You’ll see an error page when you run your application, because there is no default page in your application, so don’t worry about the error page. Simply navigate to the url above and you’ll see your result. If you’re using IE, the response will be sent as JSON, but since IE does not show JSON directly in the browser window, you’ll need to “open” the file and open it in Notepad in order to see the response. In Chrome, you’ll see the response as Xml. I have followed your way is there something im missing it keeps giving a parser error. granted im doing it VB instead of C# I think it should work pretty much the same. The reason why Im trying this out is cause I need to consume a REST with an api tht is not mine but also have it set to a Postgres database instead of it showing through a webpage. But since I dont understand the whole REST bit I thought I would try a few program samples and so far only one has worked but I have no idea how incorperate that with my actual API that i need to use. Any information would be helpful as to why I keep getting a parser error. I'd like to point you to a video on mine on YouTube. 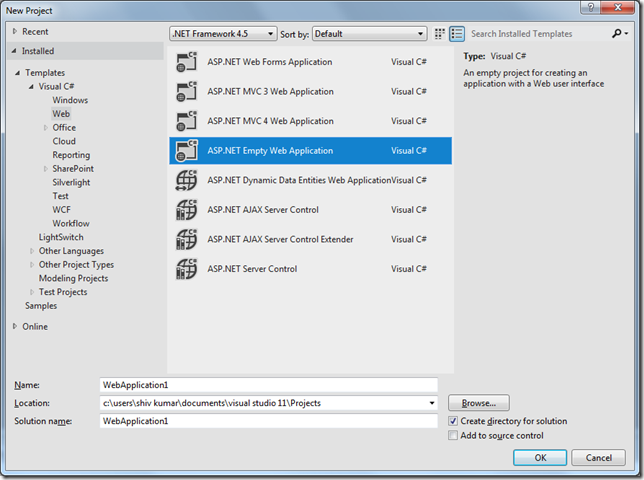 I explain the underpinnings of how the WebAPI toolkit works in ASP.NET. I think that will help you better understand what is going on under the hood.